Richard: Ha, ha, yes, that’s a fair summary – if I feel I know an artist’s work a bit (and in Serra’s case I think back to a big Saatchi show in the Eighties), I don’t particularly want to see more of the same; I want to learn and experience something new. With London Cross I had a strong feeling of “file under Richard Serra”. But like you say, it does have that sense of threat about it (but without the visceral thrill at the Saatchi show that these things could fall on you at any moment and squash you flat), and a scale that tells you there is something bigger in the room than you. The walls of the room got me thinking – they (hardboard? Temporary. Painted white in an even rollered texture) are very similar to the ones in Tate Britain and Modern and Saatchi), don’t give you the impression you’re in a real room. I wonder whether this robs the work of its power to a certain extent – the threat is weakened because you are standing in an unreal space – you have temporarily stepped out of “reality” into a zone of art contemplation. How important do you think context is to these works? David: Well it makes it very clear that the gallery is really a showroom. This fact usually isn’t that manifest though – but because Serra’s work has the durability of Stonehenge almost, it makes the gallery seem very transient. Which it obviously is. I don’t remember thinking anything like that about the Saatchi show, which I also remember clearly. That was like being with some dangerous animals in an open enclosure. This show felt a bit more like a pet shop! Some works are more self-contained though – they bring their own space with them and don’t rely on the space of the gallery in the same way. I am thinking in particular about ‘Backdoor Pipeline’ which is a work I think we both found intriguing. Two sheets of half-inch steel – corroded to a uniform brown rust colour – folded into a curved tunnel that you are invited to walk through. Is it too literal to view this as some kind of birthing metaphor? Or given the title are we being excreted when we walk out of the other end? 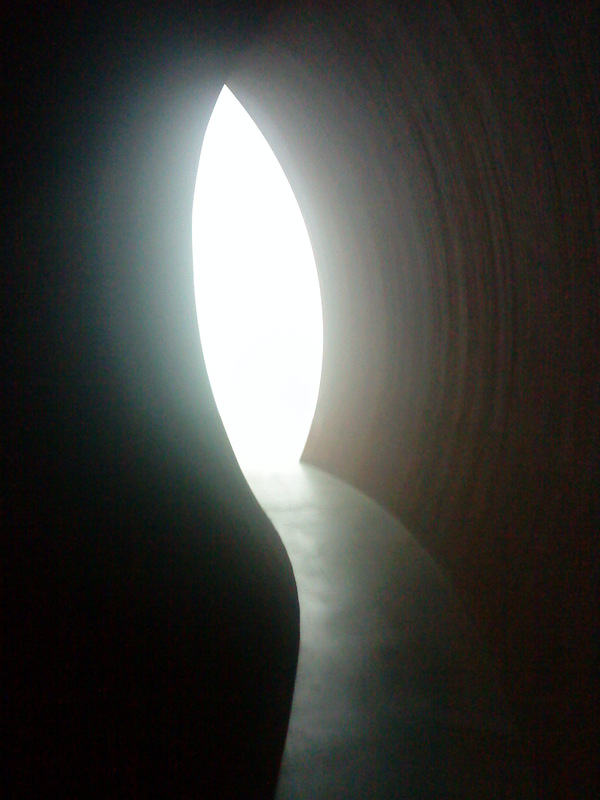 Richard: Given the shape of the entrance, I’d say Serra was strongly hinting at a birth canal. This is a very different experience to London Cross. Insomuch as a Serra can be seductive, this is. I can imagine sitting inside it for hours; the way the light from the other opening reveals itself and gently illuminates the interior curve is very satisfying. It looks as if Backdoor Pipeline has spent a lot of time outside in the rain – it’s a weathered-looking soft brown. The patina lends the metal a warmth the other works in the show lack. After the metal pseudo-graveyard which is Ramble, Backdoor Pipeline seems positively organic! David: Ramble for me is the least successful piece. It was just an obstacle between London Cross and Backdoor Pipeline. But it shares a slight hint of the representational with the latter. We both found that hint slightly atypical for Serra’s work and I think that is significant. Overall I was struck by the muteness of all his work – of a lack of direct reference to modern culture, life and imagery. Air travel, the internet, photography: all are absent. These sculptures are as mute as the Easter Island statues, or Stonehenge. Like ‘Henge, the only real cultural reference it contains is the use of a very particular material – in Serra’s case rolled steel. This is something that future archaeologists will be able to trace to the late 20th Century, and probably to specific parts of the US. But as to why we transported these huge bits of metal across oceans there will be no clue. I would be happy to use the word monumental to describe his work but the question is – a monument to what? 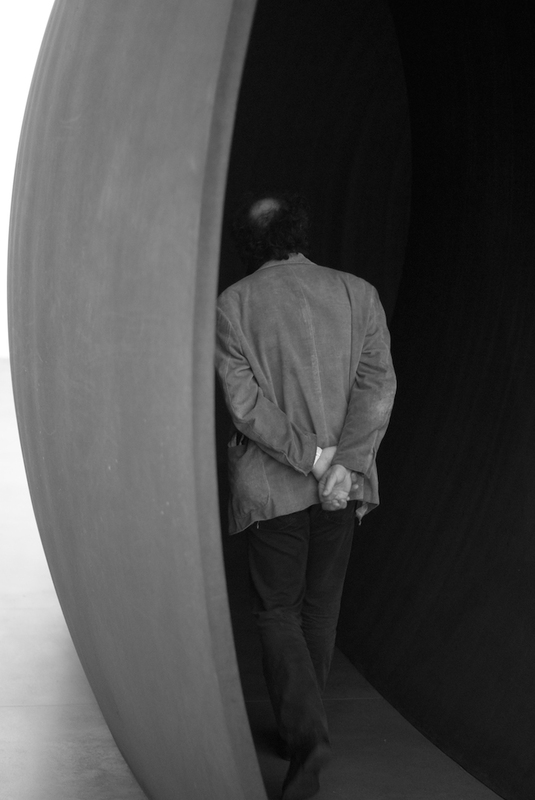 Richard: Yes, I think Serra’s work ignores all but the basic experiences of life: birth, obstacles, death. Maybe he thinks nothing else is worth confronting: no other subject matter would create the same visceral reaction in the viewer. What makes writing about these sculptures so difficult is that a big part of the experience of seeing them is the sheer scale of the things. Without being in their presence, their power is greatly diminished – as ideas what are they? David: They are difficult to write about because not only are they infuriatingly blank, but they do also have enormous presence. In the sense though that the humans walking around in the space are part of the work I think it is more akin to an installation than a sculpture, and that dictates the scale. I don’t think that is a factor when talking about Don Judd or Carl Andre whose work seems more about shape, arrangement, the play of light and so on. Serra’s work is more of a place than a thing. 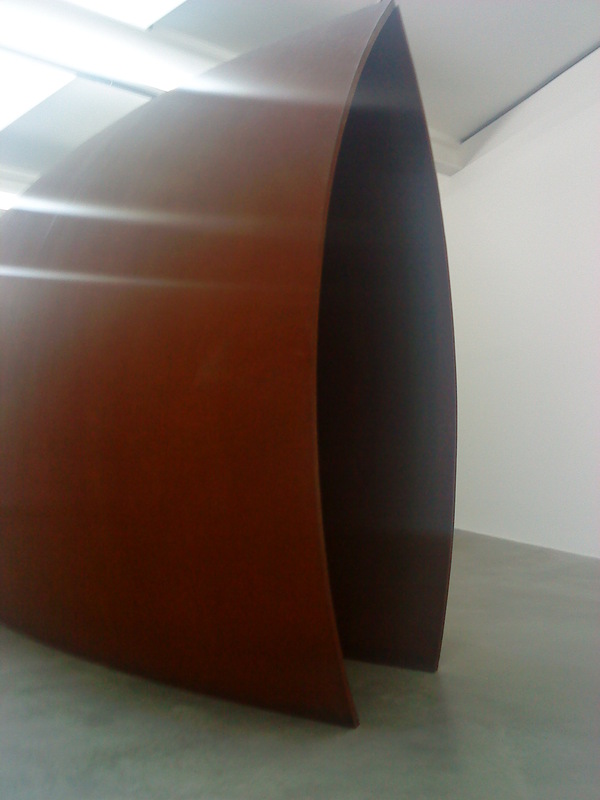 Serra was born in 1939 and I think World War 2 has influenced his work. For some postwar artists it made human representation impossible and Serra, even though a generation younger than Pollock et al, saw no way to include any direct representation. But unlike say Judd or Andre whose work seems dedicated to formal beauty and harmony (feel free to disagree! ), Serra is trying to monumentalise an abstract version of the human spirit. Or parts of it anyway. Almost as if he had been an alien trying to reconstruct us from radio telescope information without knowing what we looked like and then project it back to us in a way we can feel but we can’t see; bypassing the conscious part of the brain which is so obsessed with images and patterns. This entry was posted in American, Art, Galleries, Kings Cross, London, Sculpture, Uncategorized, With Richard and tagged 1980s, Abstract, American, Art, contemporary art, Gagosian, Galleries, Kings Cross, London, Modernism, Richard Serra, Sculpture. Reblogged this on The Future Is Papier Mâché. La mer est basse on voit les cailloux mais ” PIPELINE ” by THE VENTURES …!!! Hadn’t made the connection with Richard Serra and Surf music, but I think you are onto something! Sorry Sir , i don’t understand your thinking about me …?!!! Reading your take on the Serra show I think the white walls, cold static atmosphere could certainly lesson the impact of a Serra sculpture. One of my favorite Serra sculptures sits in an unkempt nothing special kinda place. nature’s chaos around or behind it.